Palm Harbor Villa located in Strathmore Gate East! This maintenance free 3 bedroom home is an end unit on a spacious lot and has a beautiful park like setting. Features Include: Eat in Kitchen, Closet Pantry, Laundry Closet, Glass sliders from kitchen to open patio with an exterior storage room, Living Room and Dining Room Combination with newer laminate flooring, Large Master Bedroom with two closets, updated bathroom with tiled shower and glass doors, Two Sets of Glass Sliders from master and quest bedrooms have access to glass enclosed 6 X 14 patio/lanai with gorgeous views of the back yard. The third bedroom is currently being used as a den/sitting room with built in shelving, Owner has doors to this room for re-installment, Lot's of interior closets, and 6 ceiling fans. Roof Replaced in 2008. Strathmore Gate is a pet friendly neighborhood, provides a Community Pool, Tennis Courts and Pavilion for Picnics and Community Gatherings. The Monthly Maintenance fee of $330 covers Roof, Lawn, Trash Removal, Building Exterior, Escrow Reserves, Pest Control, Water and Sewer, Community Pool and Tennis Courts. 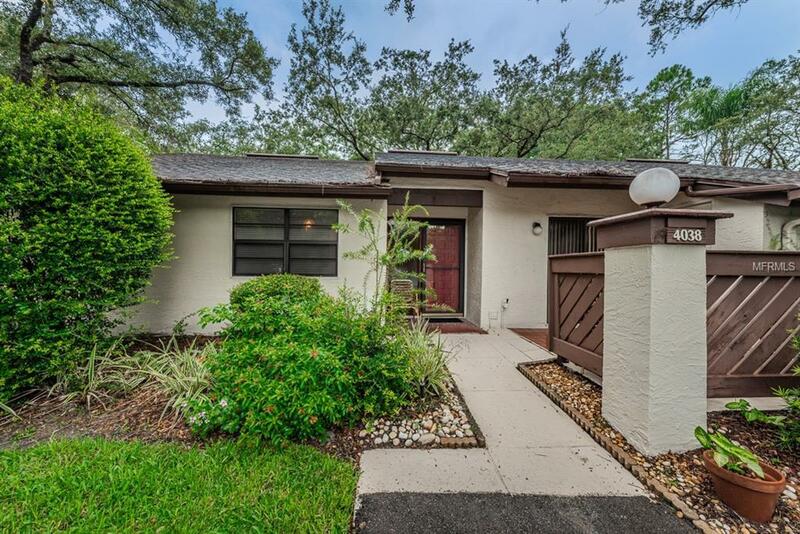 Minutes to Shopping, Theaters, Hospitals, Restaurants, Parks, Beaches, and Tampa International Airport. Listing provided courtesy of Century 21 East Lake Realty.